I’ve been playing around a bit more with the freeware program CombineZP, and I thought I’d share this image of one of the wasps I’m working on in my current position. The image is a composite from 14 photos taken through a microscope at different focal depths. 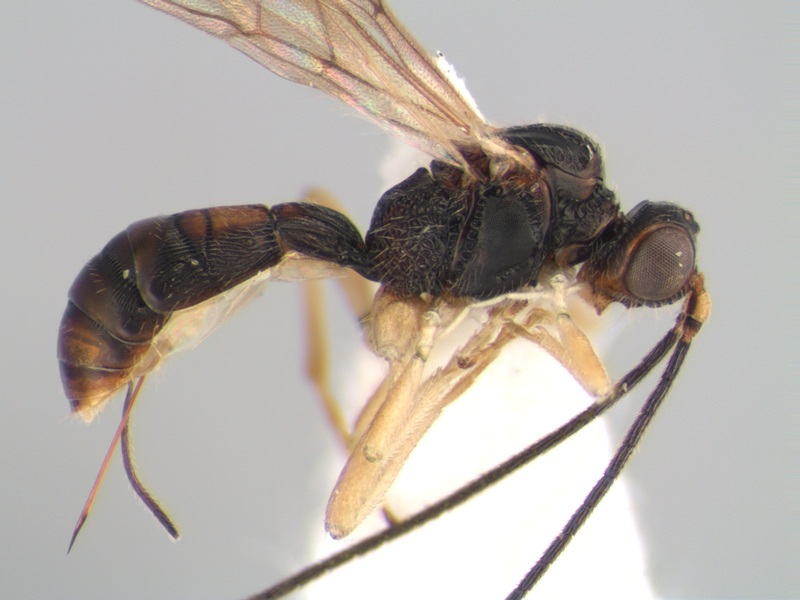 The parasitic wasp genus Heterospilus is common and hyperdiverse in the new world tropics. It is also almost entirely unstudied. Our project is restricted to the taxonomy of the Costa Rican fauna, and we have about 500 new species just from that small country. The diversity is insane- I’m not sure how we’re going to come up with names for all of them. ZooBank will supposedly have a random name generator (checked against the database and pronounceable, of course) at some point in the (near?) future. That’s one solution. Maybe we’ll just post all of them here as I image them, and the first person to comment gets the name. This one could be Heterospilus ardeansi. Jeez. I can see why patronyms become popular. If you only have a few species to describe that’s one thing, but five hundred? I can’t even imagine. Here I am getting excited hoping I’ve found one new species…. I’d be willing to bet that parasitic wasps will rise to overturn the beetles as the most diverse group of insects. Just you wait. I think that’s very cool. Anything to unseat the coleopterists, eh? Alex, if you really intend to make images of all 500 species, you should definitely have a closer look at HeliconFocus. It is substantially faster than CZP. On my PC, it works off a stack of 30 images (around 4Mb each) in roughly 30 sec. Each software has its pros and cons. The Pyramid algorithm of CZP treats overlapping structures more halo-free than the Depth-Map algorithm of HF, however, HF has a nice add-on, it has a retouching function to remove the occasional artifacts. There is another software (ZereneStacker) which is even cheaper than HF and which combines the best of both HF and CZP. It is also a bit slower than HF (about 3-4 times) but still faster than CZP, and it also has a retouching function. Anyway, I fully agree with your statement in your former Stacking post that Automontage is unjustifiedly overpriced. I used it in former times when it was the only mature stacking program but as soon as HF came of age I switched at the wink of an eye :). BTW – I am a passive but regular reader of your blog – I like the information it provides and I like your photography. As a coleopterist my interest in ants is limited but I collected lots of them in Asia for my friend Stefan Schoedl (mainly worked on Meranoplus) till his untimely death. Should you ever plan to visit the Natural History Museum in Vienna drop me a note as I would like to meet you. There is nothing like a good talk among dedicated photogs/taxonomists :). Thanks Harry! I’m always happy to hear from this blog’s lurkers. I work on a fast quadcore processor machine and CZP does not seem to be prohibitively slow. Nonetheless, HeliconFocus is one of the software packages we’ll be looking at when we go to a more permanent imaging system than the simple one I’m on now, good to hear that it comes recommended. I visited the museum in Vienna in 2004, when Stefan was still there, to check some ants against Mayr’s types. I was not prepared for just how beautiful the museum’s architecture was- I’d love to go back for another visit! mrilovetheantsi is a good species name if they’re social parasites of ants. We should name them after people who get all up in arms about science research but then depend on the very things it provides. Seems pretty parasitic to me.